Charlie Parker returns in the chilling new thriller from the Sunday Times bestselling author of THE LOVERS. The border between Maine and Canada is porous. Anything can be smuggled across it: drugs, cash, weapons, people. Now a group of disenchanted former soldiers has begun its own smuggling operation, and what is being moved is infinitely stranger and more terrifying than anyone can imagine. Anyone, that is, except private detective Charlie Parker, who has his own intimate knowledge of the darkness in men's hearts. Hey everyone. So I have decided to have a giveaway because valentines day is approaching and as I'll be alone this year (I just got dumped :| ) I thought I should spread the love in the book world. So the rules are simple. You don't have to be a follower of this blog but you will gain extra entries (3) if you are! You don't have to be a subscriber of my youtube page but you will get extra entries (5) if you are! You must be able to provide a valid shipping address. If you don't respond to my email in three days a new winner will be chosen. Leave a comment saying what is your favourite book that you have read in 2011? Leave a comment on my youtube video: Giveaway! (http://www.youtube.com/HalfBloodPrincessVW) (It will be up shortly if it isn't up already so keep checking back!) = 1 extra! There is one copy of the book The Whisperers by John Connolly for an international winner and a £25 WH Smiths Giftcard for a UK Winner. If you are in the UK and you enter you will be entered into both drawers but if you are international you will only be entered into the book giveaway this is because I'm not sure which countries have a WHsmith and the prize will be in £'s (Great British Pounds/Sterling) so US/Canada/International winners will not be able to cash it. Sorry :S.
The winner will be chosen at random on Monday 14th Feb 2011. So to enter post either a comment on this blog post or on my youtube video titled GIVEAWAY and tell me how many extra entries you can claim, your blog username/blog/ youtube name and your email address. If you don't want to post your email address on a comment, email me the information at halfbloodprincessvoiceswithin @ hotmail . co . uk . NOTE: If you are a UK enterant you CAN win both giveaways. 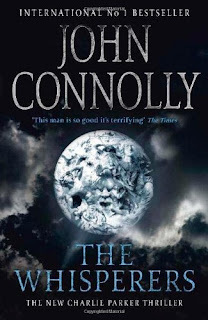 This entry was posted on Wednesday, 26 January 2011 and is filed under books,contest,giveaway,john connolly,novels,prizes,the whisperes,win. You can follow any responses to this entry through the RSS 2.0 feed. You can skip to the end and leave a response. My favorite book so far of 2011 is 'Last Sacrifice' by Richelle Mead. It is absolutely amazing!!! Thank you for the a-ma-zing giveaway! :D I'm from the UK. I haven't read that many books so far this year- but Raised By Wolves was quite good.